Black Panther earned $108 million on its second Fri-Sun frame, a drop of just 46% from last weekend’s record-crushing $202m Fri-Sun opening. In terms of raw dollars, it is the second-biggest second weekend gross of all time between Universal/Comast Corp.'s Jurassic World ($106.5m) and Lucasfilm's The Force Awakens ($149m). 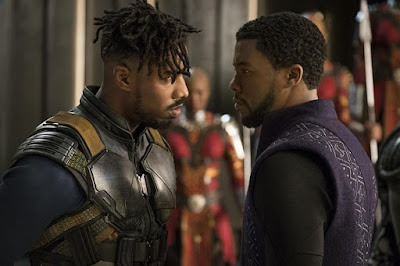 It has now earned $400m in ten days of release, which makes it the second-fastest grosser of all time (for now) behind only Jurassic World ($404m) and The Force Awakens ($540m). Even if you adjust for inflation, it’s still only behind Warner Bros./Time Warner Inc.'s The Dark Knight, Marvel's The Avengers, Jurassic World and The Force Awakens among ten-day domestic totals. It also joins fellow Walt Disney release The Force Awakens as the only other $200 million+ opener to avoid the “$100m-losers club,” as it fell only $94m between weekends. That 46% second-weekend drop is a record for an MCU flick, holding even better than Paramount/Viacom Inc.'s Iron Man (-49%), Paramount's Thor (-47%), Walt Disney's The Avengers (-50%) and Disney's Doctor Strange (-49%). Its $47 million Saturday (+66% from Friday) is the second-biggest “day 9” Friday ever behind The Force Awakens. Sure, it dropped more in weekend two than Wonder Woman (-43%) and Spider-Man (-38%), but the Disney tentpole is earning so much so quickly that it’ll be past Sony's Spider-Man ($403m in 2002, sans 3D or IMAX) and WB's Wonder Woman ($413m last year) in a matter of days. Once that happens, then Black Panther will be the third-biggest grossing solo superhero movie ever. Once it gets past $413 million domestic, it’ll be behind only The Dark Knight Rises ($448m), Avengers: Age of Ultron ($458m), The Dark Knight ($534m) and The Avengers ($623m) among all superhero movies. Once it passes The Dark Knight (sans inflation), Black Panther will be the second-biggest superhero movie and the biggest solo superhero grosser ever in North America. Barring an unlikely comedown, Black Panther will end next weekend just past the $486m domestic total of Finding Dory to be the tenth-biggest North American earner ever and among the top 100 when adjusted for inflation. Oh, and it may not stay ahead of The Last Jedi for very long. It had a (much) better hold and a larger overall second weekend, but Black Panther won’t have the advantage of Last Jedi’s post-Christmas weekdays. The Star Wars sequel made more on its second Mon-Thurs frame than its first. That’s somewhat normal for a big pre-Christmas release, which is why I wasn’t sounding the alarm bells after The Last Jedi dropped 67% in its second weekend. Now Black Panther may catch up yet again after next weekend, but we should note that The Last Jedi’s $620m domestic total isn’t remotely the bar for Black Panther’s success. That’s assuming A Wrinkle in Time breaks out, although I shouldn’t have to explain why many who worked on Black Panther will be rooting for A Wrinkle in Time even if it causes the MCU flick to take a big fourth-weekend drop. Heck, we could very well see a late March weekend where the top movies are (in random order) John Boyega's Pacific Rim: Uprising, Alicia Vikander's Tomb Raider, Storm Reid's Wrinkle in Time, Chadwick Boseman's Black Panther and Jennifer Lawrence's Red Sparrow. It may be up to Ready Player One to prove that big-budget franchise flicks starring white male leads aren’t box office poison. But that’s a highly ironic conversation for another day.